Baltimore police and prosecutors have launched investigations after video emerged from the state police department showing an officer appearing to tamper with evidence that sent a man to jail. 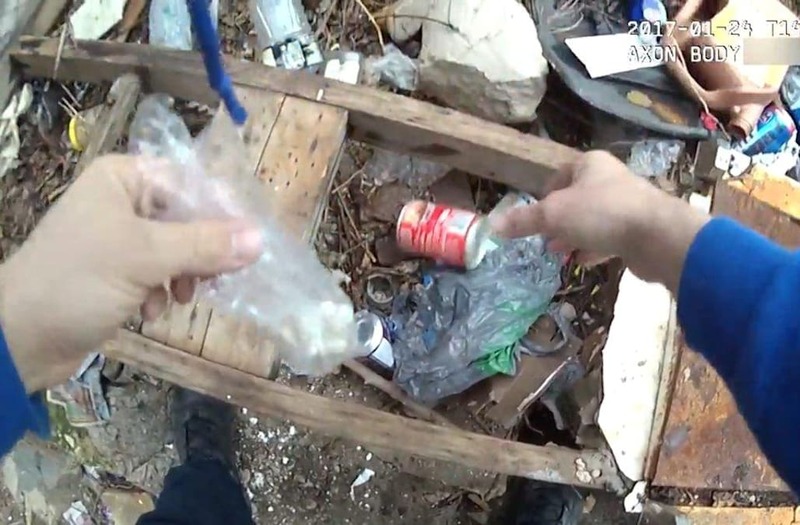 The footage shows an unidentified officer placing heroin pills into a soup can, which he sets down in trash-strewn lot. He and two officers then walk onto the sidewalk when he says, "I'm gonna go check here," and returns to the lot to retrieve the same can and remove the drugs. The Baltimore Sun reports that a man was arrested in January on drug charges connected to this footage. And though it is unclear where the drugs came from in the video, public defenders are saying the officer captured on camera planted the evidence on 27-year-old Tyrone Jones, who has been in jail since January on a $50,000 bail he can not afford, Baltimore Assistant Public Defender Deborah Levi told the local paper. According to a report from Fox 45, Jones' trial, which was scheduled for last week, was stalled after a public defender came across the video and sent it to the case prosecutor. The prosecutor writes in an email obtained by the Fox affiliate: "I've passed [the video] up and we are all appalled ... something is going to happen because of this revelation." Levi lamented to the Baltimore Sun that the officer seen handling the plastic bag in the video was called in as a witness in another case just a few days after a lawyer revealed his alleged evidence manipulation, and is a witness in over 50 other cases as well. A spokesman for the police department, T.J. Smith, said in statement that the department takes "allegations like this very seriously" and has launched an internal investigation into the accusations. "We are fortunate to have body-worn cameras which provide a perspective of the event," Smith added. However, it remains unclear if the officer in question is still working during the ongoing investigation.